This convenient travel bed offers peace of mind to parents traveling with kids. A lightweight mesh surround provides increased air flow while a large front zipper panel makes access to your child effortless. The sleeping pad comes firmly secured to the outer bottom of the tent with snaps, but is easily removable for cleaning or packing. The tent also has great features for outdoor use including UV protection and anchor straps. This handy bed fits inside carry-on size luggage, making it great for trips without having to check bags! When not in use, the tent quickly folds for storage inside its own bag making it perfect for short visits or long trips. 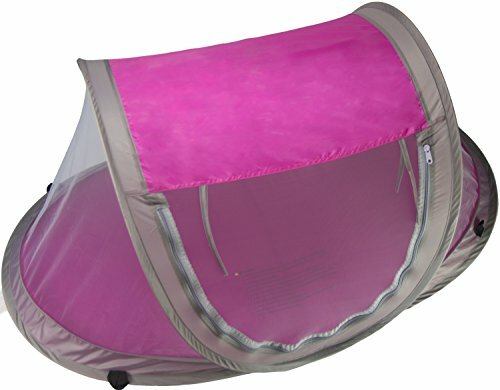 Safe for Families -Our baby tent passed rigorous CPSIA tests for children's products. They are Lead free, Phthalate free and concern free. Very safe for babies and your family. Large Size /Great Design - 46"(L) * 18"(H) *28" (D). A large front zipper panel makes access to children easy. Surrounded by lightweight mesh that promotes air flow and acts as an insect screen, this 1.5lb bed folds into a compact size. Comes with a carry/storage bag. Ideal for both Indoor /Outdoor Use - The UV protection and anchor straps for ground attachment are ideal for outdoor use. Great for park, beach etc. Soft and Comfy for babies - The tent comes fully assembled with a sleeping pad snapped to the underside of the floor providing soft and comfy bedding for your little ones. If you have any questions about this product by Cobei Homegoods, contact us by completing and submitting the form below. If you are looking for a specif part number, please include it with your message.